A small group of well connected and wealthy individuals on Prospect Park West have filed a frivolous lawsuit against the city to remove the innovative, two way bike path along side Prospect Park. Having not been able to influence policy through their community board (which voted for the project), their local city council-member (who supports the project) or convince the overwhelming majority of local residents of their perspective, they have resorted to suing the city, wasting hundreds of thousands of city dollars to defend the lane. It’s their right as citizens to do so, but this is far outside of the public process that we have worked within to date in our advocacy of bike lanes. If they are successful, it will create a chilling effect for the next generation of sustainable infrastructure building in this city. Bike lanes are relatively cheap for the city to install thanks to large Federal grants to help the city become compliant with the Clear Air Act. 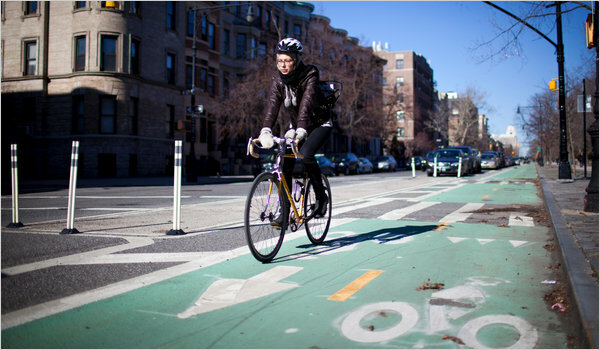 Bike lanes allow people in New York City to fulfill their desire to SAFELY travel to their destination without polluting the air we breathe. The way to fight this is people-power. We have to make sure that the voice of the people is heard and politicians understand that there is broad support for the bike lanes. The most important decision-maker about our streets is the Mayor. While we haven’t always agreed with him, we respect that he is doing the right thing in many cases and not afraid of sustainable innovation. In the case of the bike lane on Prospect Park West, we stand 100% behind the Mayor, the Department of Transportation and the hundreds (if not thousands) of everyday citizens in Brooklyn Community Board 6 that worked to make that bike lane a reality. Please hand-write a letter to the Mayor, call, fax or email him to express your support for the expansion of the bike lane network. Would love to work together for more sustainable neighborhoods. What a nice way of doing things. Love it.